The Time Lapse Shot mode instantly caught my eye when I first flicked through the GM1’s specification list. Most cameras don’t have such a mode, so I was keen to see it in action. Essentially, the time-lapse mode makes use of a built-in intervalometer, which enables the user to shoot a sequence of images at intervals of between 1sec and 99mins 99secs, adjustable in 1sec increments. The number of shots can also be set to between 1 and 9,999. Once images have been captured, they are stored sequentially in a folder on the camera. These images can then be imported into programs such as Adobe After Effect, Adobe Lightroom, Adobe Premier or QuickTime Pro, and made into a video composition. 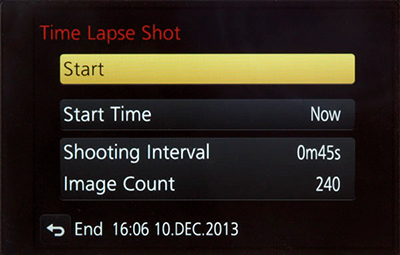 I set up my time-lapse sequence to take 240 shots at 2sec intervals, which took 8mins. I then compiled the images into a 24fps composition, which gave me 10secs of footage. The final result was a video showing 8mins of time elapsing in just 10secs in real time, made entirely from photos. This is a great tool for making dynamic landscape pictures with moving clouds, or for capturing other active scenes.